Is your family outgrowing your home? If you love the location, but need more living space Consider calling the Wilton home addition contractors at Allure Home Improvement & Remodeling, LLC. We'll show you options for adding living space to your home, and help you chose the solution that is best for your family and your wallet. Whether a you decide to put a second story addition on your Wilton house, build and addition off the back or side of your home or finish your basement, Allure Home Improvement & Remodeling, LLC is the remodeling company that can get it done in the most fair and practical manner. If you own a single story home, building up, rather than out may be your most economical solution. Second story additions are generally less expensive than building out from your home. This is because adding a new foundation is often your biggest expense. Whether you already have architectural plans or you'd like to use one of our designs, Allure Home Improvement & Remodeling, LLC is knowledgeable in Wilton building codes and regulations. We'll have you moved into your new second story addition in no time. First floor room additions may be the perfect solution if you require additional living or guest space, such as an in-law apartment, especially if finishing a basement is not an option. Room additions can get pricey, but Allure Home Improvement & Remodeling, LLC remodeling experts will work with you within your established budget. 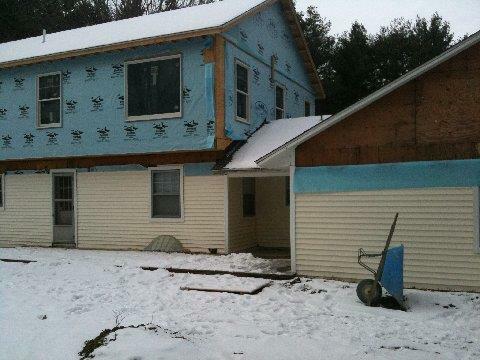 From framing to flooring to sheetrock and plumbing, Allure Home Improvement & Remodeling, LLC will handle every step of your new home addition in Wilton. You tell us what you want and we'll work within your time frame and family budget to deliver it. Allure Home Improvement & Remodeling, LLC can work with you to design your addition, or work off of your existing plans. From flooring to lighting to the final nail in the wall, Allure Home Improvement & Remodeling, LLC's remodeling team will be hard at work. All work is guaranteed; the job is not complete until you are fully satisfied.